Pro-governmental militiamen from the coastal town of Zawiya, west of Tripoli, retook the base in Janzour after a “short exchange of fire,” the security source told the AFP news agency on condition of anonymity. Other militias allied to the Tripoli administration were also reported to have moved more machine-gun-mounted pickups from the coastal city of Misrata to the capital to defend it against Haftar’s forces. The advance by Haftar’s forces on Thursday, which came as the United Nations prepares to convene a conference later this month on organising delayed elections, prompted UN chief Antonio Guterres to voice his “deep concern”. On Friday, Guterres held talks with Haftar after flying to Benghazi and driving to the commander’s base. “My aim remains the same: avoid a military confrontation. I reiterate that there is no military solution for the Libyan crisis, only a political one,” Guterres said on Twitter. The group’s fighters have been variously aligned with the government in the capital and a rival administration in the east backed by Haftar’s forces. A convoy of vehicles from Haftar’s forces had on Thursday pushed towards the city of Gharyan, some 100km south of Tripoli, witnesses and military sources said. Haftar said “the time has come” to take the capital in an audio message released on Thursday, pledging to spare civilians and “state institutions”. His forces’ spokesman Ahmed Mesmari said they were “at the gates of the capital” on Thursday evening. Sarraj on Thursday condemned Haftar’s “escalation” and said he had ordered loyalist forces to prepare to “face all threats”. “The situation should be resolved peacefully,” Kremlin spokesman Dmitry Peskov said. “We need to throw water on the fire, not petrol on the fire,” Salvini said. The United States and its allies issued a joint statement urging “all parties to immediately de-escalate tensions”. Haftar – who receives support from Saudi Arabia and its allies Egypt and the United Arab Emirates – held talks in Riyadh late last month and his forces have reportedly received major arms deliveries from the UAE, including aircraft, despite a UN embargo. 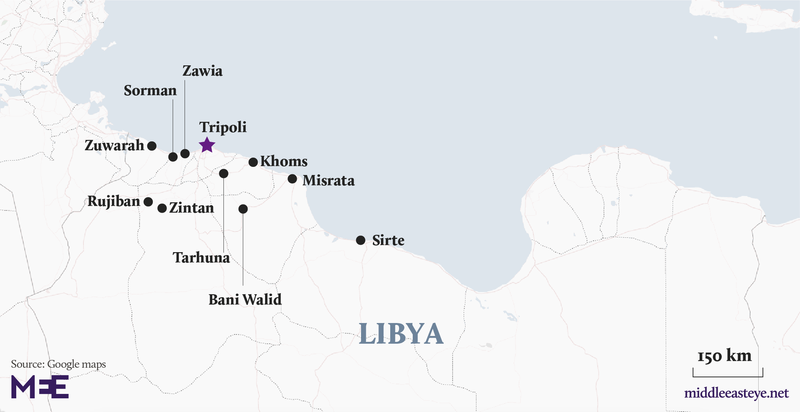 The government’s writ is now largely confined to the narrow coastal strip around Tripoli and the third city of Misrata to its east.